According to a news report, on 8 February volcanic tremor occurred at Tokachi that lasted for 37 minutes. A Japan Meteorological Agency monitor did not see any emissions or other signs that an eruption had occurred. During 1995-1996, Tokachi (also called Tokachi-dake) intermittently experienced increased seismicity (BGVN 20:07, 20:08, 20:11/12, and 21:05). The volcano is located in central Hokkaido, the northernmost of Japan's 47 prefectures (figure 6). Figure 6. A map showing the major volcanoes of Japan; Tokachi is in the upper right. Courtesy of the U.S. Geological Survey. Monthly reports of volcanic activity from the Japan Meteorological Agency (JMA) translated into English resumed in October 2010. The only recent English-translated JMA report on Tokachi appeared in June 2012. The only other account available on this volcano between 1996 and June 2012 was in 2003, when a news account (Associated Press) mentioned that volcanic tremor occurred on 8 February 2003 and lasted for 37 minutes. This news account noted that the JMA saw no emissions or other signs that an eruption had occurred. According to JMA, a small event in Taisho crater occurred, apparently on 1 June 2012. Hot gas from this event flowed down the NE and E flanks of Tokachi. Aerial observations on 1 June 2012 with an infrared camera revealed high temperature areas on the E wall of Taisho crater. No ejecta such as volcanic ash was observed around the crater. A field study that same day measured the average sulfur dioxide flux as 600 metric tons/day (t/d). After 4 June, the crater's temperature and gas emission volume decreased. According to JMA, on 30 June 2012 volcanic glow in the Taisho crater was observed with a high-sensitivity camera. This glow gradually brightened toward the early morning of 1 July and continued through the early morning of 5 July. Thereafter, the glow diminished, suggesting a decreasing temperature. JMA believed the glow stemmed from the emission of high-temperature volcanic gases and the burning of sulfur. No changes occurred with respect to volcanic earthquakes, tremor, ground deformation, and infrasonic data either before or after the period of volcanic glow. On 1 July, infrared camera observations again revealed high-temperature areas on the E wall of Taisho crater. These high temperatures persisted through most of July, after which they returned to normal. Several reports in July noted a small new fumarole near an existing fumarole on the E wall of the crater. Scientists conducting a field survey on 1 July measured the flux of sulfur dioxide from the fumarole at 600 t/d. No field surveys were conducted after 3 July because of bad weather, but officials believed that SO2 levels had decreased, given that emissions from the fumarole had decreased. On 11 July, instruments recorded small-amplitude, short-duration volcanic tremor. This was followed by small-amplitude volcanic earthquakes until the next morning. These events were not accompanied by any change in fumarole emissions, infrasonic data, or ground-deformation data. The hypocenters were located just beneath the shallow part of the Ground Crater (in Japanese, Guraundo-kako; translates into English as "old crater"). In July, GPS ground deformation data at Mae-Tokachi-Dake, a stratovolcano cone of Tokachi, found a small area of inflation at the shallow part of a crater designated as 62-2. Information Contacts: Japan Meteorological Agency (JMA), Otemachi, 1-3-4, Chiyoda-ku Tokyo 100-8122, Japan (URL: http://www.jma.go.jp/); Associated Press (URL: https://www.ap.org/). On the morning of 29 May, personnel of JMA's Tokachidake Volcano Observatory saw hot muddy water being ejected from a fumarole on the 1962 crater wall. The next day, they found that a 10-15-m fissure [or an elongated crater] had formed [on the wall of the 1962 crater]. Muddy water was continuously ejected from the fissure during their observations. This activity stopped on 5 June. Thermal activity at the crater has been gradually increasing since 1983, although local seismic activity has remained at background levels. Thermal activity that formed new vents [on the wall of] the 1962 crater began in late May and continued through July. Beginning on 29 May and ending 5 June, hot muddy water was ejected from a new 10-m-diameter oval vent in the wall of a summit crater formed in 1962. Weak ash emission occurred nearby on 19 June, forming a second new vent, also oval and about 15 m in diameter, on 20 June. Molten sulfur burned in and around the new vents and weak red glow was observed over the 1962 crater from the town of Biei, 7 km away, on the nights of 20-22 June. The second hot muddy water ejection began on 24 June. JMA personnel from the Tokachidake Observatory visited the crater on 9 July and found that this activity had stopped. On 25 July, a third ejection began at the June vent and continued through 31 July. The maximum height of white plumes from the two new craters was 80 m [in July]. Seismicity remained low in June and early July, as in previous months. Thermal activity at the 1962 crater has been gradually increasing since 1983. The third phase of hot muddy ejection began on 25 July. Muddy water was carried 10 m above the [new crater that had formed on the E wall of the 1962 crater] when ejection began, but gradually declined. As of 1 November, water ejection had not been observed from the Volcano Observatory since 6 August. Figure 1 shows recently formed features at the E wall of the 1962 crater. Figure 1. Sketch map of the E wall of the 1962 crater of Tokachidake on 7 June (top), and 25 June (bottom). Courtesy of JMA. Further Reference. Miyakawa, H., Maekawa, T., and Yokoyama, I., 1986, Monitoring of the temperature by infrared thermometry at the crater wall of Tokachi volcano, Hokkaido: Geophysical Bulletin, Hokkaido University, v. 47, p. 17-31. Thermal activity remained at a relatively high level around the June 1985 crater, which formed on the E wall of the 1962 summit crater during an eruption of hot muddy water [from two fissure vents]. Underground temperatures around the crater have increased since 1984, to 529°C during a field survey on 7 October 1986. Continuous tremor was recorded on 20 December 1986 from 0020 to 0046 at a seismograph station 4.5 km NNW of the 1962 craters. Volcanic tremor had last been recorded on 1 September 1985. Tremor resumed at 0716 on 11 February and lasted for 32 minutes. Smaller amplitude tremor (~10% of former events) occurred on 21 February and twice on 1 March, lasting 12, 13, and 43 minutes respectively. Swarms of volcanic microearthquakes were recorded on 25 November and 6 December 1986. 82 events were registered on 25 November and 32 events on 6 December by the seismograph 2 km NW of the 1962 crater. Local seismicity was at a high level in November. A seismometer, 4.5 km NW of the three craters active in 1962, recorded 29 events on 15 November, 9 on the 19th, and 10 on the 26th. The month's total increased to 93 from  in October. Four shocks were felt, three on 15 November and one on the 27th. Epicenters were estimated to be around crater 62-2. On 22 November, personnel at the JMA Tokachidake Observatory saw a 1,200-m steam plume emerge from crater 62-2, the highest since a 1,400-m plume in June 1981. Addendum. The press reported that Tokachi began to erupt on 19 December at 2148 [but see 13:12], ejecting incandescent tephra and a plume that rose about 2 km. Ash fell on two cities more than 100 km NE of the volcano. A lahar about 30 m wide flowed 2.5 km downslope. Children within 25 km of the volcano were kept home from school the next day and residents were warned by officials to be ready to evacuate. The eruption had apparently declined, but seismicity was continuing. Tokachi-dake's first large eruption since 1962 followed more than two months of gradually increasing seismicity. The number of recorded earthquakes began to build in late September, totaling 43 in October and 93 in November compared to the typical background level of 10-20 events/month (figure 2). Stronger seismicity from 19 November was followed by emission of a 1,200-m white plume on the 22nd from crater 62-2, one of a line of vents formed during the 1962 eruption. Occasional episodes of volcanic tremor, the first in more than a year, had been recorded since 4 October and became more frequent in early December. Eruptive activity followed through most of December. Figure 2. Monthly recorded earthquakes (top), number of volcanic tremor episodes (middle), and height of highest observed cloud (bottom) at Tokachi, 1965-88. Courtesy of JMA. Snow darkened by ash was first noticed on 5 December. A gray plume rose 200 m on 10 December and ash again fell near the crater. No gray plumes had been seen since 1962 from JMA's Tokachi-dake Observatory, [5.8] km NW of the crater, although bad weather has often prevented observation, especially in winter when the crater is only visible about once a week. Tremor episodes were more frequent after 11 December. Light gray to gray plumes were again observed 11-12 December. Darkened snow was seen from the air the morning of the 13th, extending ~1 km N from crater 62-2, and Observatory personnel saw a gray to dark gray plume emerging from the crater from about 1430 to 1600 that day. A vigorous phreatic eruption from crater 62-2 began at roughly 0600 on 16 December. The eruption was preceded by an earthquake at 0524 that was felt at intensity III (JMA scale) in Fukiage, 3 km W of the crater. Volcanic tremor was recorded between 0603 and 0611 but weather clouds obscured the crater and the start time of the eruption remains uncertain. Ash began to fall at Ikeda, 80 km SE of the volcano, at around 0700. A similar sequence began on 18 December at 0838 with an earthquake felt in Fukiage at intensity I, followed by 21 minutes of volcanic tremor. Clouds again obscured the volcano, but ashfall began around 0900 at towns as much as 30 km E of the volcano. An earthquake on 19 December at 2148 (intensity I in Fukiage) marked the onset of phreatomagmatic activity from crater 62-2 that was accompanied by a long period of high-amplitude volcanic tremor. People near the volcano saw an incandescent column and a dark volcanic cloud. A small mudflow, generated by snowmelt, moved ~600 m down the NW flank, reaching 1,400 m elevation. Yoshio Katsui noted that a pyroclastic surge had melted snow in an area of 500 x 800 m. Although the highest ash cloud seen from the Observatory reached only 300 m, ash reached Abashiri and Kitami on the NE coast of Hokkaido, 150 km from the volcano. Weak volcanic tremor continued intermittently the next day and a light gray to gray plume was rising 200-400 m during the morning. Slight ashfalls were reported to 35 km from the volcano on the 21st and to 15 km 22-23 December. Periods of volcanic tremor continued. A larger phreatomagmatic eruptive episode began at 2212 on 24 December, accompanied by an earthquake. An incandescent column rose 200 m and the 1-km ash cloud contained lightning. A pyroclastic flow advanced 1 km NW but there was no mud flow and no property was damaged. At 2232, the mayor of Kami-Furano instructed residents of 3 inhabited areas within 15 km W of the crater to evacuate; 2 minutes later, the evacuation of the Shirogane area, 6 km NW, was requested by the mayor of Biei. Population of the four affected areas is about 800. Vigorous eruption resumed at 0049, feeding similar columns of ash and incandescent tephra. JMA Observatory personnel saw a glowing flow descend to the NW. Volcanic tremor was recorded 0049-0315 and 0332-0340. Tremor and emission of a gray plume continued intermittently during the day. Ashfalls extended 80 km SE. A morning overflight revealed a somewhat enlarged 62-2 crater, but other craters and fumarolic areas appeared unchanged. Fieldwork by Katsui and others documented a pyroclastic flow 1 km long with a maximum temperature of 92°C at 50 cm depth, 60 hours after the eruption. An earthquake at 0527 on 30 December, felt at intensity 1 at Fukiage, marked renewed eruptive activity. Weather clouds prevented observations but ash fell 30 km SE. Evacuation of the Kami-Furano area was cancelled 31 December, but was continued for Shirogane residents. Red glow and ejection of a black cloud were observed from the JMA Observatory on 1 January at 0212. The eruption seemed small and only nearby ashfalls were reported. Activity resumed briefly on 8 January at 1938. An incandescent column was seen for a short time but weather obscured the volcano from JMA Observatory staff. Ash fell on towns to a few tens of kilometers SW of the volcano but no damage was reported. An earthquake was recorded at the beginning of the 8 January activity, probably an explosion shock of the type common in earlier explosive episodes. Volcanic tremor followed for about 10 minutes, and geologists presumed that the eruption ended as tremor ceased. Of the three types of JMA official volcano information releases, the most serious (Volcanic Activity Information) is issued when volcanism is considered to be dangerous to people. VAI releases appeared three times during the eruption, all during the 24-25 December activity, while Extra Volcano Information reports were produced 23 times in November and December for activity judged less hazardous. By 8 February, 20 eruptive episodes had occurred from crater 62-2 (figure 3). During January, crater 62-2 emitted steam with occasional small amounts of gray ash. Red glow from the crater was seen almost every night from JMA's Tokachi-dake Volcano Observatory. White plumes continuously rose a few tens of meters from craters 62-0 and 62-1. Red glow in Taisho Crater was often seen 8-14 January. Residents of the Shirogane area (6 km NW) have remained evacuated since the 24-25 December eruption. Figure 3. Summary of volcanic and seismic activity at Tokachi-dake, February 1988-January 1989. Courtesy of JMA. Seismicity was at a high level during the second half of January. A seismometer (4.5 km NNW of the volcano) registered 126 volcanic earthquakes during the month, an increase from 104 in December. Volcanic tremor episodes with amplitudes of about 0.1 µm were intermittently recorded by the same seismometer. An earthquake swarm, centered ~25 km E of the volcano, began on 14 January. Some of the events were felt at the observatory. The strongest had an intensity of III on 14 January. 16 January at 1855: the eruption was accompanied by an earthquake felt at Intensity I at the Observatory. Ash fell as far E as Nukabira, 45 km away. Cloudy weather prevented plume observation. A field survey on 18 January revealed that a pyroclastic flow had advanced 1 km down the NW flank, along the same route as the mudflow caused by the 24-25 December eruption. 20 January, 0322: The eruption was accompanied by a weak explosion sound and incandescent column. Low-frequency volcanic tremor began 2 minutes before the eruption on the Hokkaido Univ seismometer at Hinangoya, 1 km ENE of the 1962 craters. Ash fell 30 km E of the volcano. A 900-m-high, grayish-white plume was seen from the Observatory at 0700. [An explosion on 22 January is listed in 14:2]. 24 January, 1224: The highest plume of the month reached 1,000 m above the crater. 28 January, 0518, 0611, and 0700: three explosions were accompanied by air shocks. Explosion sounds were heard at Shirogane hot spring, 6 km from the crater. Cloudy weather prevented plume observation. Slight ashfall was observed as far as 80 km SE of the volcano. 1 February, 1818: Low-frequency earthquakes were recorded at Hinangoya at 1700, preceding the eruption. Ash fell 70 km E.
4 February, 0038: Ash fell 100 km from the volcano. [See 14:2 for explosions 6-7 February]. 8 February, 0402: An eruption was accompanied by an explosion sound and incandescent column. A small pyroclastic flow descended from the crater. During the first eight days in February, five explosions from crater 62-2 were recorded. On 5 March at 0522, a brief eruption occurred after 25 days of quiet. No ground shocks were felt, but small earthquakes were recorded at 0522, 0524, and 0526. Volcanic tremor was intermittently recorded 0523-0725 by a seismograph 4.5 km NNW of the 1962 craters. Cloudy weather obscured the active crater, but when visibility returned, a blackish-gray plume was observed at 0810. A 1-km-long, narrow mudflow, produced by the eruption, descended NW along the same path as December-February mudflows and pyroclastic flows. A small amount of ashfall was reported ~25 km SE of the 1962 craters. A total of 21 eruptions have been recorded or observed (table 1) since 16 December 1988. The seismograph 4.5 km NNW of crater 62-2 recorded 49 earthquakes in February (see figure 4). Seismicity declined to low levels after mid-February. A grayish-white plume steadily rose 300-500 m above crater 62-2. Table 1. Eruptions at Tokachi from 16 December 1988 through 5 March 1989. Courtesy of JMA. 19 Dec 1988 2148 more than 150 km Largest ashfall, mudflow. 24 Dec 1988 2212 80 km Mudflow, evacuation. 25 Dec 1988 0049 80 km Pyroclastic flow. 16 Jan 1989 1855 40 km SE Pyroclastic flow. 08 Feb 1989 0402 140 km E Pyroclastic flow. 05 Mar 1989 0522 25 km SE Mudflow. Further Reference. Special Section: The 1988-1989 eruption of Mt. Tokachi, central Hokkaido: Bulletin of the Volcanological Society of Japan, v. 35, no. 2 (July 1990), p. 111-215 (6 papers, in English). Activity continued to decrease in March. Since the brief 5 March explosion (14:02) no explosions have been observed and seismicity has been low (figure 4). The steam plume reached a maximum height of 1,000 m above the rim of 62-2 Crater at 1300 on the 28th. An earthquake swarm that began 14 January . . . declined during March. Figure 4. Monthly number of earthquakes at Tokachi-dake (top) and maximum monthly plume heights (bottom), January 1983-March 1989. Courtesy of JMA. Tephra produced by the phreatomagmatic explosions that began 19 December contained a little fresh magma (scoria and blocks) of basaltic andesite composition similar to that of the 1926 and 1962 ejecta. Some of the pyroclastic flows and surges melted snow and fed small lahars. A detailed description of this eruption can be found in Katsui (1989). No eruptive activity has occurred since a brief explosion from crater 62-2 on 5 March. A continuous steam plume, which often contained ash in May but was white in June, was observed from Tokachi-dake Observatory. Plume heights reached 800 m above the crater rim in May and 100-600 m in June. A seismograph 4.5 km NNW of the crater recorded only five volcanic earthquakes and no volcanic tremor in May, but seismicity increased in late June (figure 5). A total of 25 volcanic earthquakes was recorded in June, and seismicity remained elevated as of early July. Figure 5. Daily number of local seismic events, 1 January-9 July 1989 (top) and number of small earthquakes recorded by a seismograph ~2 km NW of the volcano, 11 June-9 July 1989 (bottom). Courtesy of JMA. Reference. Katsui, Y., ed., 1989, The 1988 eruption of Tokachi-dake, its sequence, mechanism, and influence on community: Report of Natural Disaster Scientific Research no. B-63-5, March 1989, 108 pp (8 papers). Weak volcanic tremor was recorded 19 June.... The tremor episode was the fifth and strongest recorded since April 1989 (table 2).... The number of earthquakes has remained fairly constant since August 1989. Table 2. Amplitude of volcanic tremor episodes at Tokachi, May 1989-June 1990. Increased seismicity starting on 9 July was recorded 4.3 km NNW of the 1962 crater. The peak daily high for the month took place on 17 July (28 events). During the entire month of July there were 101 events. Not since January 1989, when 179 seismic events were recorded, have >100 events occurred in one month. Information Contacts: Volcanological Division, Seismological and Volcanological Department, Japan Meteorological Agency (JMA), 1-3-4 Ote-machi, Chiyoda-ku, Tokyo 100, Japan. A volcanic tremor event and 20 seismic events were observed on 18 August at Station A, 4.5 km NNW of Crater 62-2. On 23 August another 19 events were recorded. In total, 77 earthquakes were detected in August. This period of increased seismicity began on 9 July. During the second half of December, the number of earthquakes gradually increased, totalling 103 for the month. Consisting of a NE-SW aligned group of stratovolcanoes, Tokachi has a record that includes a partial cone collapse in 1925 that led to ~144 deaths and 5,000 homes destroyed. High seismicity during 18-22 May included 50 events on the 19th. Neither volcanic tremor nor any geophysical changes were observed. A seismicity increase also occurred in December 1995 (BGVN 20:11/12). Tokachidake volcano consists of a group of dominantly andesitic stratovolcanoes and lava domes arranged on a NE-SW line above a plateau of welded Pleistocene tuffs in central Hokkaido. Numerous explosion craters and cinder cones are located on the upper flanks of the small stratovolcanoes, with the youngest Holocene centers located at the NW end of the chain. Frequent historical eruptions, consisting mostly of mild-to-moderate phreatic explosions, have been recorded since the mid-19th century. 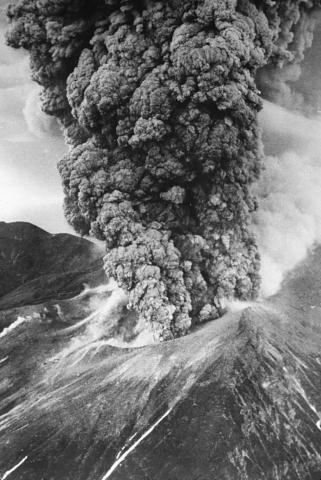 Two larger eruptions occurred in 1926 and 1962. Partial cone collapse of the western flank during the 1926 eruption produced a disastrous debris avalanche and mudflow. Fujiwara S, Nakagawa M, Hasegawa S, Komatsu D, 2007. Eruptive history of Tokachi-dake volcano during the last 3,300 years, central Hokkaido, Japan. Bull Volc Soc Japan (Kazan), 52: 253-271 (in Japanese with English abs). Katsui Y, Kawachi S, Aramaki S, Kondo Y, 1989. The 1988-89 eruption of Tokachi-dake, its sequence and mechanisms. Rpt Nat Disaster Sci Res, no B-63-5 (in Japanese with English abs). Katsui Y, Kawachi S, Kondo Y, Ikeda Y, Nakagawa M, Gotoh Y, Yamagishi H, Yamazaki T, Sumita M, 1990. The 1988-1989 explosive eruption of Tokachi-dake, central Hokkaido, its sequence and mode. Bull Volc Soc Japan (Kazan), 35: 111-129. Yamagishi H, Feebrey C, 1994. Ballistic ejecta from the 1988-1989 andesitic Vulcanian eruptions of Tokachidake volcano, Japan: morphological features and genesis. J. Volcanol. Geotherm. Res., 59: 269-278. 1887 Jun Unknown Confirmed 2 Historical Observations Lower part of Maru-yama? Koshiromaru, T, 2012. Crustal deformation around 62-II crater of Tokachidake volcano, central Hokkaido Japan, depicted by InSAR of ALOS/PALSAR. (abstract STT57-04) Japan Geoscience Union Meeting, Makuhari, Chiba, Japan. There is no Emissions History data available for Tokachidake. Tokachi volcano, seen here in eruption in 1988, consists of a group of stratovolcanoes and lava domes arranged on a NE-SW line above a plateau of welded Pleistocene tuffs. Numerous explosion craters and cinder cones are located on the upper flanks of the small stratovolcanoes. 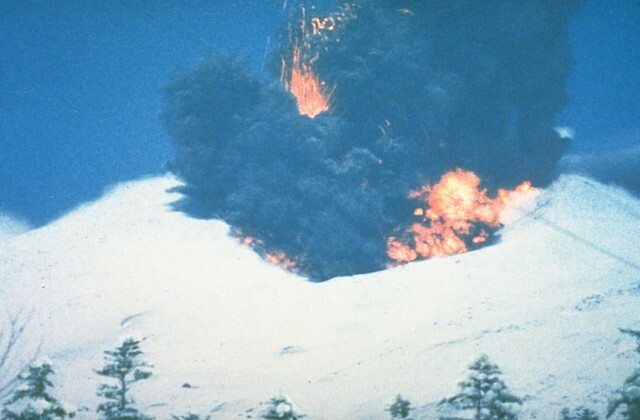 Frequent historical eruptions, consisting mostly of mild-to-moderate phreatic explosions like this one in December 1988, have been recorded since the mid-19th century. Two larger eruptions occurred in 1926 and 1962. Photo courtesy of Japan Meteorological Agency, 1988. A phreatomagmatic explosion on December 25, 1988, from Japan's Tokachi volcano ejects incandescent blocks and a dark ash cloud. The base of the ash column is the leading edge of a small pyroclastic surge that eventually traveled down the north flank to 1 km from the vent. 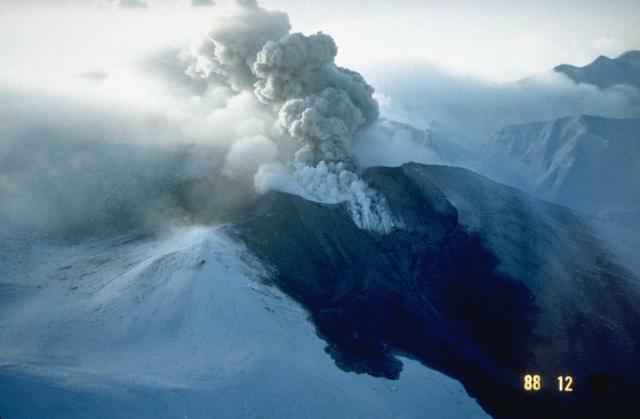 The 1988 eruption began with a phreatic explosion on December 16. Intermittent explosive eruptions with small pyroclastic flows and surges began on December 19 and continued until March 5. Snowpack on the western flank of Tokachi volcano preserves individual layers of pyroclastic-surge and pyroclastic-flow deposits from the 1988-89 eruption. 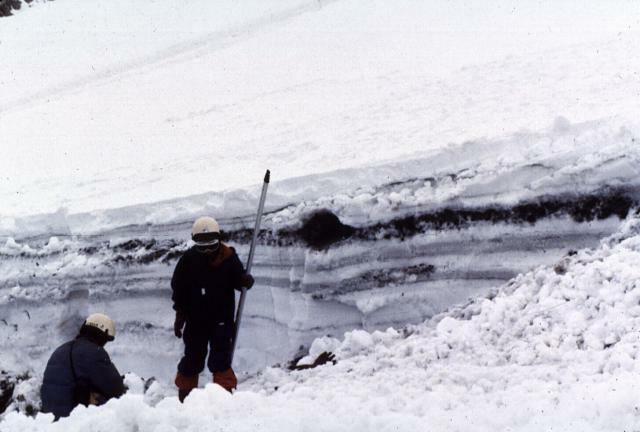 Because the eruptions took place during the winter, contemporaneous snow fall proved very useful to scientists in distinguishing the deposits of small-scale eruptions that lasted only a very short time. Photo by Mario Yoshida, 1989 (Hokkaido University). An ash-rich eruption column towers above Tokachi volcano on June 30, 1962. A phreatic explosion June 29 that killed five sulfur-mine workers was followed three hours later by a magmatic eruption. It continued strongly for 11 hours, producing a 12-km-high eruption column. Weak eruptions continued intermittently until September. Photo by Asahi Shimbun, 1962 (courtesy of Mario Yoshida, Hokkaido University). IRIS seismic stations/networks Incorporated Research Institutions for Seismology (IRIS) Data Services map showing the location of seismic stations from all available networks (permanent or temporary) within a radius of 0.18° (about 20 km at mid-latitudes) from the given location of Tokachidake. Users can customize a variety of filters and options in the left panel. Note that if there are no stations are known the map will default to show the entire world with a "No data matched request" error notice. Large Eruptions of Tokachidake Information about large Quaternary eruptions (VEI >= 4) is cataloged in the Large Magnitude Explosive Volcanic Eruptions (LaMEVE) database of the Volcano Global Risk Identification and Analysis Project (VOGRIPA).